I set out this week to do some initial holiday shopping. Thanksgiving is over and I’m ready to decorate. 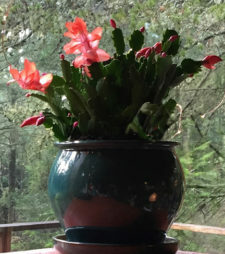 With my dog-eared Island a’ la’ Carte Coupon Book from the Mullis Center I saved 15% at Ace Hardware on a promising Christmas Cactus and the pretty blue pot I put it in. There are over 100 coupons in this valuable little booklet and I’ve resolved to keep mine in my shopping basket. Bonnie’s Craft Supply, Browne’s, and the Drugstore are all dog-eared in my coupon book with holiday shopping in mind. My dentist’s coupon is so generous it will cover the price of the entire book. The Island a la Carte Coupon Books are an important fundraiser for the Mullis Community Senior Center and are on sale now for the holidays. Regularly they are $30, but through the end of the year you can purchase a single book for $25 or pay $20 each for two or more. “…Great for Stocking Stuffers, Secret Santa gifts, Hostess gifts, Office gifts, and more”. There are a wide variety of coupons and one for almost every restaurant in Friday Harbor. Is your vegan niece coming to visit? Treat her and yourself to a meal Mike’s Café and Wine Bar and get a free appetizer. A free game at Paradise Lanes, admission to The Whale Museum, even a family swim at San Juan Fitness are among the savings on fun activities. You could even rent out Brickworks at a 20% savings and throw a party! Island a’ la’ Carte Coupon Books can be purchased at the Mullis Center at 589 Nash Street, Mondays – Fridays, 9 AM – 4 PM. You can choose from wrapped or unwrapped for the same great price. They can also be purchased at the Chamber of Commerce. To learn more about the Island a la Carte Coupon Book, contact Anna at the Mullis Center at 360-378-9102. Happy shopping!